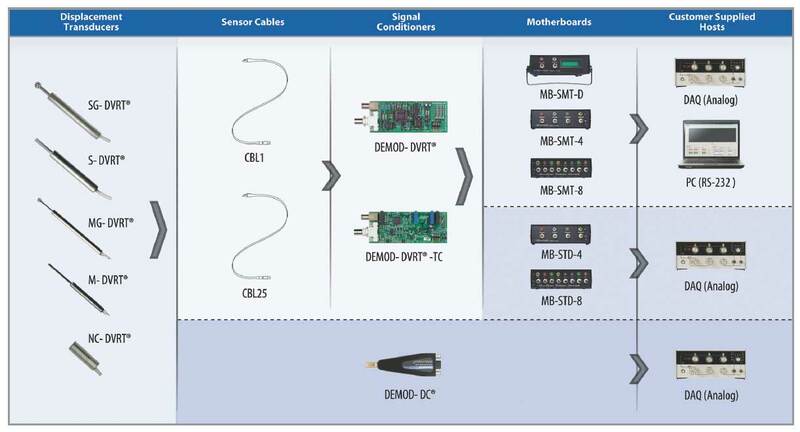 The DEMOD-DC® in-line signal conditioner makes DVRT® sensors as easy to use as a potentiometer. With integral signal conditioning electronics, the user connects power, ground and analog out, and the DEMOD-DC® outputs a buffered, high-frequency response voltage proportional to linear position. During the manufacturing process the analog output voltage is digitally trimmed, ensuring that every DVRT®’s offset and gain values match one another. The DEMOD-DC® provides internal power regulation and reverse polarity protection, and will operate with a wide range of input voltages. There are no software or firmware downloads for this product at this time. Is there a mating connector for the DEMOD-DC? Yes. A Micro-D connector with color-coded wire pigtail is provided and is designed to complete the run to a DAQ. Do DVRTs always require a Motherboard or Smart Motherboard to operate? No. LORD MicroStrain® makes a DEMOD-DC which provides an alternate method of DVRT signal conditioning. The DEMOD-DC provides conditioning as an in-line connector and connects to your DAQ. Although not normally recommended, a DEMOD-DVRT or a DEMOD-DVRT-TC can be used without its Motherboard enclosure; external power is the only requirement.